Why is Advantage Rainscreen Siding Better? Advantage Rainscreen Siding™ is a gorgeous siding option that elevates your home. Advantage Rainscreen™ transforms the way you install wood siding. Traditional siding is installed via face screws and plugs. This process works well, but the gap between each board can allow the accumulation of water and moisture, leading to potential wood deterioration. This entry was posted in Ipe Siding, Siding Installation and tagged Advatnage Rainscreen, Ipe Siding, Siding Profiles on March 31, 2015 by Mr. Ipe Hardwood. Rainscreen siding is a beautiful option that does not require any predrilling! This post is dedicated to answer our customers frequently asked questions (F.A.Q.s) about our Advantage Rainscreen Siding™ profile. This entry was posted in Ipe Siding, Siding Installation and tagged Advantage Rainscreen, Rainscreen profile, Rainscreen siding Questions on December 5, 2013 by Mr. Ipe Hardwood. Back-priming is the process of applying a coat of primer to wood, or siding, to prevent moisture from entering the material. Now, why don’t we just do that instead of going the long way around this? Priming does not completely protect the materials from moisture, but it is extremely important that if you oil the front of the siding, to oil the back of the siding. Back-priming is great practice, but do not rely on this process alone to protect your siding from water intrusion. Moisture will still manage to penetrate the siding through minute cracks and crevices, no matter how well you think you’ve primed each and every board. Softer woods such as cedar and pine definitely benefit with extra primer. These types of woods are more prone to water damage. 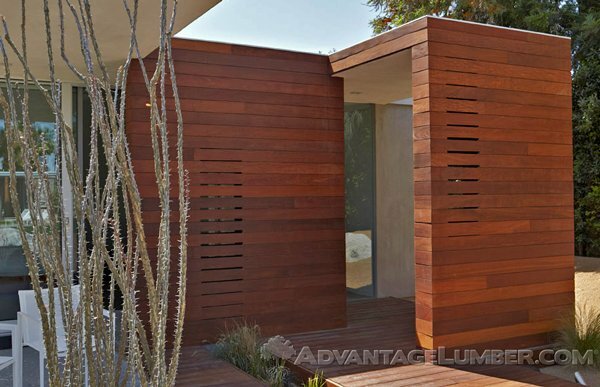 Exotic hardwoods such as Advantage Rainscreen Ipe™ and Advantage Rainscreen Cumaru™ are infused with natural oils that make them less susceptible to water intrusion. Normal primers will begin to peel when applied to exotic hardwoods, and oils that would normally adhere to softer woods, will only gum up on these types of woods. Only use approved oils on exotic hardwoods. What if I still decide to Back-prime? Only use approved oils and primers on exotic hardwoods, and any wood for that matter. The last thing you want is to ruin all of your siding because you didn’t use an approved oil for the type of wood in your project. Set aside enough time for the primer to dry, at least 48 hours. Sand all sides of each piece of siding. This allows you to level the board for superior adhesion of any oils and paints you decide to apply. This may seem like a tedious task, but it allows you the chance to ensure your finished surface has a smooth and linear look. Back-priming is a process that should be well researched before installation begins. Make sure you only use approved oils and primers for the materials you are using and allow adequate time between application and installation. You want to make sure that everything is done correctly to ensure the maximum life expectancy of your siding. This entry was posted in How-to Build, Siding Installation, Wood Siding on October 18, 2012 by Mr. Ipe Hardwood. How is airspace created between rainscreen siding and the housewrap? By using furring strips. Furring is a process that has been around since the 16th century. Originating in England, it was developed to solve the problem of ships that were too narrow. They would lay another plank on top of the previous plank to expand the size of the ship. 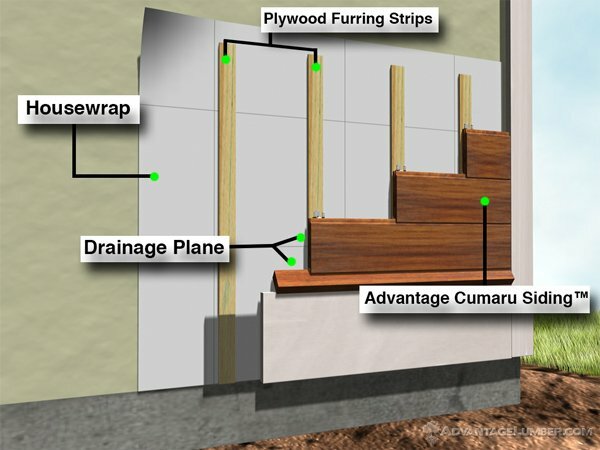 Essentially this is what is being done when you install furring strips for your Advantage Rainscreen Siding™. Furring strips are one of the essential elements to ensure adequate ventilation of your siding. Furring strips are long thin pieces of material usually made of wood or metal. They are used to make a backing surface for the siding to attach to. These strips create the drainage plane that is essential for rainscreen siding to be effective in the way that it was designed for. The drainage plane is what allows the siding to air out, making it last longer. In the absence of this plane, rot, mold, and decay could become a catastrophic problem. How Should I Install the Furring Strips? Furring strips should be installed vertically. Installing them horizontally might sound like an acceptable idea, but it’s unsuitable for what we’re doing. Even if you were to take the time to cut enough slits in the strips for drainage, there is still no guarantee that it’s sufficient enough for the rainscreen siding to ventilate properly. Honestly you’d be making more work for yourself, and that’s not what you want. Installing the furring strips vertically is the best option for proper ventilation. Make sure that after installation that there will be enough airflow present when the siding is placed on the strips. Should I Cover the Furring Strips with Housewrap? This seems like a sensible question. Housewrap keeps water out of the underlying structure of your home, so wouldn’t it make sense to wrap the furring strips as well? It would keep the water out, but it’s not necessary in this process. The only exception would be if you were to use metal furring strips, then they could be covered with housewrap, or tar paper, to slow down the possibility of corrosion. Leave the furring strips exposed so they dry out completely. Furring is a process that has been around for hundreds of years. These strips create a solid foundation to attach the siding to and allows for a drainage plane so that gorgeous Advantage Rainscreen Siding™ last for years and years. This entry was posted in How-to Build, Siding Installation, Wood Siding on October 17, 2012 by Mr. Ipe Hardwood. Hardware is the most essential element to your Advantage Rainscreen Siding™ project, or any project for that matter. If you don’t know what is holding your home together, how will you know if it’s reliable? It might be tough to distinguish the good from the bad, when all of these companies have conflicting information. But beware, they aren’t all right. Stainless steel is the most reliable type of hardware that can be used on any outdoor project. There are two basic types of hardware available on the market for siding installation: galvanized and stainless steel. Pressure treated wood (which is typically the material used for furring strips) is usually treated with an alkaline copper quaternary (ACQ) or copper azole (CA). These are copper based materials that are used to slow down rot and decay of the wood, but in return, these chemicals eat the hardware. 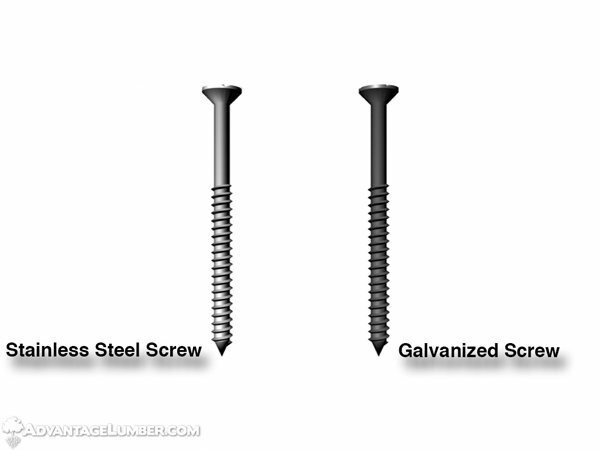 Now, galvanized hardware was thought to solve this issue, and in a way it does. Manufacturers coat galvanized steel with zinc. The zinc does a good job at resisting rust, but it’s not so good at resisting corrosion. The copper that is present in the pressure treated wood will always corrode the zinc. If it’s not the wood, the weather will eat away at it, therefore causing corrosion and failure of the hardware. Stainless steel has always been a reliable go-to hardware material. The nickle and chromium that make up stainless steel are what make it resistant to corrosion. Unlike galvanized hardware, it doesn’t rely on a coating for protection. 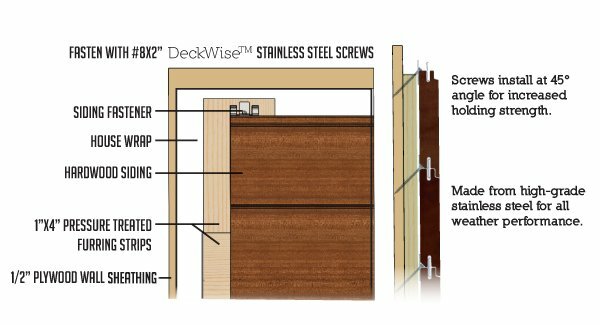 Unfortunately stainless steel hardware costs more, but when you’re talking about the reliability of the furring strips and your siding, why cut corners? It’s such a small percentage of the overall cost of your project. Lastly, never mix and match hardware. When some metals come into contact with one another they can form corrosive reactions. Only use top rated fasteners. 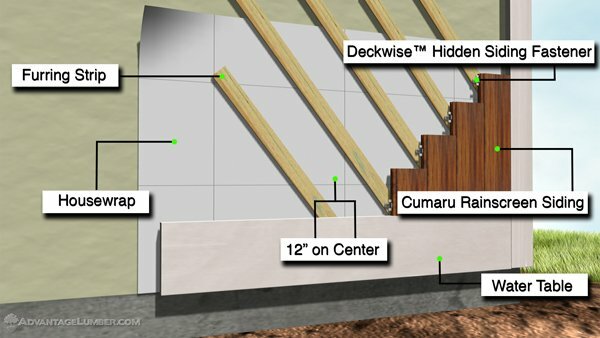 Advantage Lumber™ recommends DeckWise™ Hidden Siding Fasteners. These fasteners are made from solid stainless steel. They are designed to reduce cupping, twisting, and mold growth that can happen with water penetration. Most rainscreen siding profiles work with the hidden siding fasteners. Choosing the right hardware is essential for your Advantage Rainscreen™ project. When you are assured that your siding is secured with the proper hardware, you can just sit back, relax, and enjoy your stunning home. This entry was posted in How-to Build, Siding Installation, Wood Siding on October 5, 2012 by Mr. Ipe Hardwood. So you’ve decided Advantage Rainscreen Siding™ is the right choice for your home renovation project. The only problem is that you want your home to stand out amongst the crowd of run-of-the-mill looks. For an eye-catching look not seen in many homes, vertical installation* of rainscreen siding is a definite possibility. When you combine the warm and inviting look of real, natural Advantage Hardwoods with an application such as vertical siding, you can get the dynamic look you are aiming for. Although, exotic hardwoods have a much better resistance to rot, mold, and decay, vertical installations of any type of siding will increase the potential for water intrusion. What’s the best way to install vertical siding while decreasing the chances of water retention? Install furring strips diagonally. The diagonal furring strips need to be nailed at 12” on center and at a 45° angle. Start installing on the right and work your way to the left. This will still allow the airspace to get the ventilation it needs. With this placement of the furring strips you can install the siding vertical, horizontal, or in a pattern. Use rainscreen siding fasteners for easy installation. To install start at the corner using the starter clip that comes with your fastener kit, and attach it to the side. Fasten the siding to the furring strips, make sure to drive the stainless steel screw at a 45°, and then place the next piece of siding in to the fastener with the pre-molded groove. 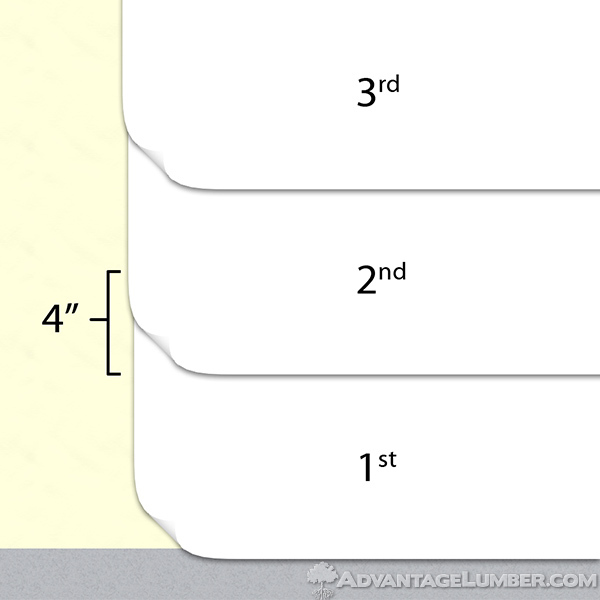 Use a level to ensure the boards are aligned properly. When dealing with outside corners, you can use a vertical siding corner post. Can You Install Furring Strips Horizontally? Horizontal furring strips are not something that I recommend. While typical siding installation require furring strips to be installed vertically, this is not the case when it comes to vertical siding installation. If vertical siding was set onto horizontal furring strips, any water that intrudes would have no place to go. With that much water retention, problems like rot and decay will lead to even more problems like air leaks. Even if you take the time to cut enough slits in the strips for drainage, there is still no guarantee that it will be sufficient enough for the rainscreen siding to ventilate properly. Stick with vertical or diagonal furring strip placement for the best possible outcome. Diagonal furring strips can open up doors when it comes to rainscreen siding patterns. Don’t you want to own a house that your neighbors will envy? It will look spectacular and will also help your siding last for years and years. 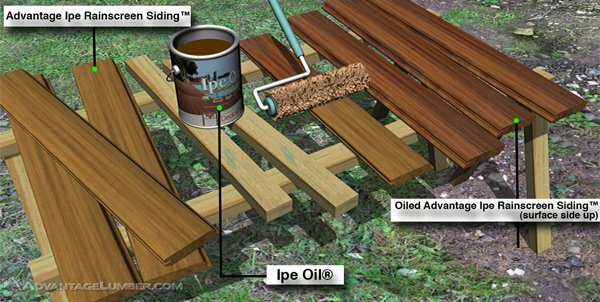 This entry was posted in How-to Build, Ipe Siding, Siding Installation, Wood Siding on September 10, 2012 by Mr. Ipe Hardwood. Housewrap is your home’s last defense against the damaging effects of rot. They are constructed to be water and UV resistant, as well as handle years of abuse in different climates. If a home is constructed without properly installing housewrap and siding , the insulated framing cavities can get wet and can lead to rapid rot and decay. When installed properly, housewraps will keep the water out, and keep the structure of your home dry. Housewrap is a water-resistant synthetic material that protects the structure of your home from moisture damage. Not only does it protect your home against ice and water intrusion, it also creates a drainage plane, allowing water to evaporate before seeping into your home’s structure. This material usually contains polymers, nylon, or fiberglass and comes in large rolls for easy application. By acting as an insulator and reducing the exchange of airflow, housewrap can also save you money in energy bills. This entry was posted in How-to Build, Siding Installation, Wood Siding on August 27, 2012 by Mr. Ipe Hardwood.